This man needs no introduction now, does he? I mean everybody knows Eric Clapton. He's only one of the most famous, influential and respected artists of all time. 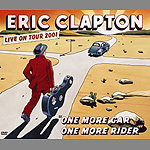 "One more car, one more rider" is a chronicle of the tour that was undertaken to promote last year's "Reptile" album. As far as live documents go, it's as close to perfect as you can get. Between the songs chosen, the performance and the production, it's spot on. Spread over two discs and at nineteen songs long, this should serve as a fine introduction to the man, the legend, for the uninitiated and as a great reminder for those who are already fans. There's a dominance of slow bluesy numbers, especially at the start of the first disc, which opens rather poorly with a version of 'Key to the highway' that fails to sparkle. That's only a minor setback on the road, though. Ranging from 'Have you ever loved a woman?' and 'River of tears' to 'Got you on my mind', 'Bell bottom blues' and 'Cocaine', how can any fan of Clapton not want this? It is of course the two big ones, 'Layla' and a superb 'Tears in heaven', that ultimately steal the show. This is outstanding and proof that the best just get better with age.